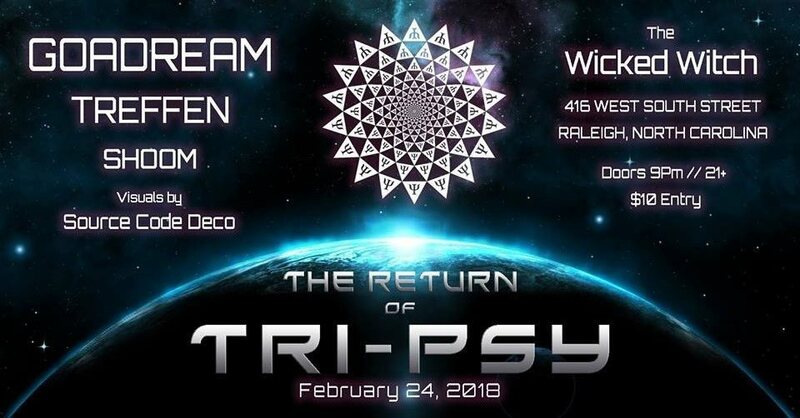 Tri-Psy create's events that shine the limelight on this wonderful, lovely and respectable community that has been hidden in NC for the past 20+ years. So come and support because we are going to build these events to get this developing area in the World of PsyTrance map! Shoom began mixing Goa & Psytrance in 2004, guesting weekly on WKNC 88.1 FM in Raleigh, North Carolina, where he was able to hone his skills of mixing live and spontaneous. Shoom soon began to record mixes for Digitally Imported Radio's Goa-Psy Trance Channel. His mixes combined depth and focus to create full length audio journeys that told meaningful stories. In 2008 Shoom took over Program Director duties of Digitally Imported Radio's Goa-Psy Trance Channel. A few years later he created their PsyChill, Progressive Psy, Psybient, and Dark PsyTrance Channels. He organizes the popular Summer and Winter Solstice Events on the Goa-Psy Trance and PsyChill Channels that feature top acts from around the world. Truly a musician that lives up to his name which is German for; to meet or to hit. When he plays no one can help but to meet up and hit the dance floor. :P He has a jubilant contagious smile while playing that makes you want to just want to join in on the fun. While providing well-manufactured mixes Treffen portrays highly energized picturesque atmospheres of concrete bass and elegant melodies. Jacob Goadream’s love for electronic music was activated in the early 90's in the dawn of warehouse parties in Houston, Texas with House music with Techno soon following. A decade later PsyTrance found him and it immediately found a place in his heart. That place lead him to mountains of North Carolina where T.O.U.C.H. Samadhi was waiting for him with open arms and he soon developed an urge to join the ranks of amazing PsyTrance artist and become a DJ himself. A DREAM come true, especially with his presentation of boundless complex funky beats. He surely leads us into another realm of consciousness and provides stunning harmonious sets that we will never forget! A wonderful crew that creates immersive atmospheres combining science, music, spirituality, and geometric shapes. "The Wicked Witch" is Raleigh's newest venue that really portrays the underground atmosphere we all love. There is the closed business in the same building yet also residential area across the street. We do request that everyone keep the noise to a minimum when commuting to and from vehicles. There is parking at a closed business that the venue as permission to utilize. There will be signs. This venue is Cash Only! An ATM is provided with a $1 fee. in 0.199 seconds server time.